Education is very important for every child regardless of their gender. It is sad that some communities still discriminate against the education of the girl child.UN agencies estimate that about 57million children around the world are not going to school. According to a report, Children Still Battling to go to School, 95% of the 28.5 million children not getting a primary school education live in low and lower-middle income countries – 44% in sub-Saharan Africa, 19% in south and west Asia and 14% in the Arab states. Educating children including girls is very important. An African proverb says, “If we educate a boy, we educate one person. If we educate a girl, we educate a family – and a whole nation.” By sending a girl to school, she is far more likely to ensure that her children also receive an education. Investing in girls’ education is therefore seen as investing in a nation. 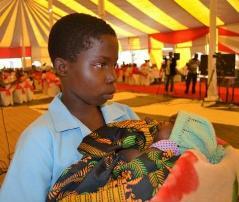 Current Problem: Many teenage girls continue to drop out of schools due to early pregnancies and early marriages. The problem is so pronounced in rural areas of Malawi. The Project: Through a radio programme, Centre for Solutions Journalism advocates for the return of teenage mothers to school. The project also entails forming Teenage Mothers’ Radio Listening Groups who share their experiences with the peers through the mass media.